1. There were 18,000 reasons why Wigan decided to interrupt their Super League season to play a friendly against Souths. The Warriors made no apology for stating the motivating factor for their mini-tour Down Under was to make money - both immediately and longer-term - and the crowd of 18,721 at the oversized ANZ Stadium, to watch two exhibition games, was an unqualified success. 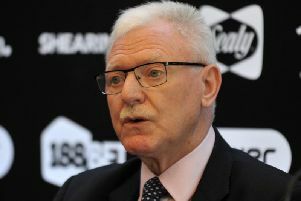 The trip has given players, staff and fans great experiences, earned Wigan new fans and strengthened ties with old ones - little wonder owner Ian Lenagan is keen to repeat the bold venture. 2. Sadly, Wigan couldn’t round-off the trip with a win which Shaun Wane craved. 3. They had started so well. With a starting line-up comprised of squad numbers one to 13 - how often does that happen? - they took an early lead through Tom Davies’ neat effort in the corner, and his second later in the half kept them in the contest at 12-8 at the break. There was something surreal about seeing the NRL bunker rule on Wigan tries... though not nearly as surreal as the ad hoarding for Uncle Joe’s Mintballs at ANZ Stadium! 4. Wigan’s entire touring squad, minus Frank-Paul Nuuausala, featured in the game and the constant chopping and changing had an impact. It was a shame fans didn’t get to see the lethal left-edge. The younger players certainly didn’t disgrace themselves, but inevitably the combinations suffered from the switches. Of the fringe players, French forward Romain Navarrete again caught the eye as he tries to nudge into the first-team frame. Sensibly, Wane limited the involvement of some of his key players, mindful of their Super League game at Warrington this Friday. 5. And so the weekend results showed all three Super League sides lost to NRL opposition. Did that fact damage the competition’s credibility? Maybe, although no-one was saying Super League is the stronger competition after two wins against the Aussie sides in the World Club 12 months ago! The World Club Challenge was one-way, but Melbourne mauled a few NRL sides last year, too, and won the Grand Final easily, while Wigan’s and Hull’s games were glorified friendlies. So, more than anything, it probably reinforced what was already know - their depth of talent pool is far greater, they play the game a different way and, judging by the reaction of the Australian commentators, the British fans are much louder!